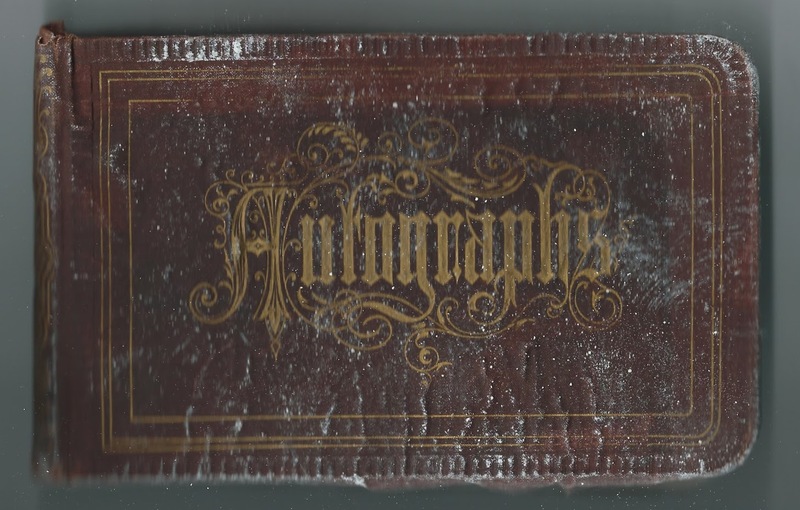 1879-1880 autograph album of Katie Giesser of Buffalo, New York. She was Katharine Giesser. The album measures approximately 7-1/4" x 4-1/4" and contains the sentiments of over 50 of Katie's relatives, friends and schoolmates. An alphabetical surname list and an alphabetical list of the signers, together with any personal information they offered, appear at the end of this post. The album is in poor condition with water damage, and the coating of many of the pages has flaked off. Someone, presumably Katie, added notes to a few of the pages; i.e. married names or death dates. The saddest of these was the page signed by Fred Nachtrieb [not sure of surname]. He either signed the page at Galion, Ohio, or was from there. He dated his page July 15, 1879. A later note indicated that he died on August 3, 1879. A Carrie A. Nachtrieb also inscribed a page. Katherine Giesser, "Katie", was born about 1866 in New York, the daughter of Gabriel and Friedrike Giesser. Katie had several siblings, some of whom signed pages in her album. Brother Fred Giesser signed on December 19, 1879. See a history of the Giesser Building at 99 Genesee Street in Buffalo; there's also a bit of family history. 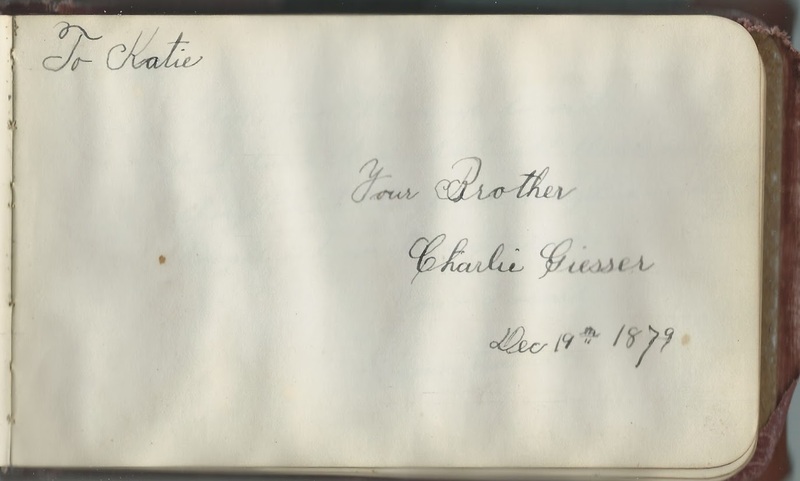 Katie's brother Charlie Giesser inscribed a page, also on December 19, 1879. Katie's sister Louise Giesser inscribed a page on February 6, 1879. Katie's sister Jennie inscribed a page on January 19, 1879. A later note, added presumably by Katie herself, gives Jennie's year of death as 1933. According to one of the short biographies in the "Memorial and Family History of Erie County, New York", published in 1908, Katharine Giesser, Katie, married Buffalo attorney Edward David Strebel on June 22, 1892 and had two children with him, a son Robert L. Strebel and a daughter Edna F. Strebel. Edward died in 1933, and Katherine in 1955. They're buried at the Forest Lawn Cemetery at Buffalo, New York. Water damage on page. Signed at Buffalo, New York, on January 24, 1880 by Tiny; last name possibly Rud or Kud or ? Water damage to page: given name Sarah; surname too faint to read. Emma Blechner, signed at Buffalo, New York, on January 24, 1880. Water damage to page, so not sure of names, places,dates. Mary Brysen, signed at Buffalo, New York, on November 19, 1879. Faint writing due to water damage; not positive of surname. Katie Giesser of Buffalo, New York; album owner Katherine Giesser, who would marry Edward David Strebel in 1892. "Your Sister Louise", signed on February 6, 1879. Katie's older sister Louise Giesser. "Your Sister Jennie", signed on January 19, 1879. Later note: died 1933. Perhaps Katie's older sister Johannah Giesser. Emily M. Hess, signed January 24, 1880. Water damage on page so name/date might be in error. Water damage. Possibly W. H. Meads or N. H. Meads, signed on October 9, 1879. If W. H. Meads, perhaps Willis H. Meads. Fred Nachtrieb, signed at Galion, Ohio, on July 15, 1879. Later note: "Died August 3rd 1879"
Julia Smith, signed April 26, 1879. Someone later wrote the name Koester; Julia later married William L. Koester. Hattie Smith, signed at School on November 20, 1879. Later note: "Howe", presumably the surname of the man Hattie would later marry. Chr. Volz, signed at Buffalo, New York, on January 27, 1880. Page written in German. Perhaps Rev. Christian Volz of Buffalo, New York. Anna M. Werner, signed at Buffalo, New York, on June 2, 1879. Page is faint from water damage, so not sure of the name and date. Susie Zacher, signed on February 10, 1879; middle initial might be K or ?